In our latest article refresh, we removed a few dated audio interfaces and replaced them with two excellent entry-level models worthy of your time – the robust Mackie Onyx Artist 1X2 and the all-round quality Tascam US-1X2. Not so long ago, recording music at home was difficult for many, and out of reach for most. However, with the advancement of modern technology – in particular devices like audio interfaces – we finally have a way to easily record audio at home without having to break the bank. What to Expect From a $100 Audio Interface? Can I Record Vocals with a Budget Audio Interface? How to Choose a Budget Interface? In today’s article we are taking a look at some of the best audio interfaces that come in at under $100. As you’re about to find out, recording guitars and vocals at home is now not only possible but also very affordable. After the chart we will take a closer look at buying one of these devices, but let’s begin with a rundown of our top picks. A stylish and somewhat different audio interface that brings rock solid performance. One of the oldest designs that is still very much relevant today. A true workhorse that combines versatility with rock solid performance and consistency. Incredibly affordable, yet very practical model that performs up to the standards. A rather niche, but ultimately awesome interface that caters to traveling musicians. Another new entry to this chart is the Onyx Artist 1-2 from Mackie, who promise (and deliver!) zero-latency monitoring, excellent recording quality, and an audio interface that’s built like a little tank! In addition to being very durable, the Onyx Artist 1-2 features an Onyx mic preamp with great sound quality. Controls and I/O options are a little limited, but no less than you’d expect at this budget price range, including a 1/4” TRS input and XLR mic input. As we mention in the full Mackie Onyx Artist 1-2 review, this device is a great way to capture your performance on the go – and on the cheap! Tascam’s US-1X2 is a new entry to our chart, but soars to the top spot for the overall feeling of quality and value from such an affordable audio interface. As we highlight in the complete US-1X2 breakdown, it features an eye-catching modern design, with a sturdy black aluminum chassis and chunky side panels that give it a bit of attitude. It’s not the most versatile audio interface on our list in terms of I/O options, but it comes with XLR and TRS input for both mics and switchable line-level/instrument-level recording. Plus, the mic preamp is one of the best in the budget range. A solid choice! 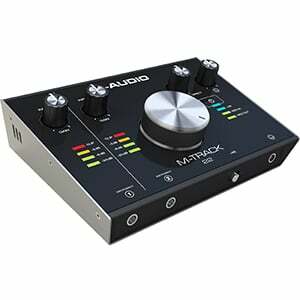 The M-Track 2X2 C-Series from M-Audio belongs to the category of audio interfaces that does things differently. This is very apparent from the way it looks, as well as the hardware that’s packed inside. With a unique retro-esque design (certainly one of the coolest on this page), the whole device oozes confidence. The build quality is commendable, as is the performance, with extremely low signal coloration and noise levels. This makes it a great choice for those who need clean vocals on a budget. As we highlight in the full review of the M-Track 2X2 C-Series, it comes with an excellent software package and is ready to go out of the box. The main selling point of the PreSonus’s AudioBox 2x2 is the performance – it’s an excellent entry-level interface with a Class A microphone preamp, that means vocal have a very clear sound quality. It’s nothing special in the design department, but isn’t ugly. The plus is that the aluminum chassis is virtually bulletproof. Additionally, there is a versatile offering of I/O ports, while PreSonus ships this interface with a great software package. Overall, a solid package for both beginners as well as advanced users. 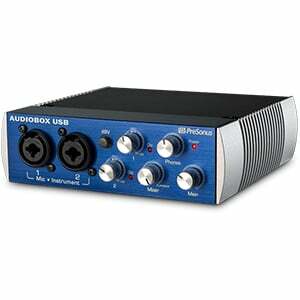 You can read more on the PreSonus AudioBox 2x2 in the complete review. Behringer’s U-PHORIA series of audio interfaces has pushed the bar high when it comes to delivering good performance at a budget price, while the entire series is designed to offer more versatility than you can find elsewhere. The U-PHORIA UMC204HD is a perfect example of this! It features two versatile inputs (combined XLR/TRS ports) and four outputs, as well as decent controls. It is loaded with Behringer’s MIDAS microphone preamp, which is highly rated and delivers great vocal clarity. In the full Behringer UMC204HD review, we mention that this flexible little device packs a lot of punch at a relatively small price. It’s well worth checking out! Steinberg may not be a brand associated with budget solutions or cheap gear, although their UR12 audio interface is incredibly affordable while getting the job done. While the design leaves a lot to the imagination, the UR12 is built well and feels simple to use. It features two channels for mic and instrument use (both with their own gain control), allowing you to record both guitars and vocals. There are also two options for powering the device – using the standard USB cable or a 5V DC via mini USB, for use on a mobile device. As we suggest in the complete review, the Steinberg UR12 is a very decent choice. Line 6 is a brand well-known for creating some of the most affordable guitar accessories on the market, including everything from amplifiers to audio interfaces – such as their Sonic Port. Only compatible with Mac OS DAWs, this guitarist-focused interface is the most niche on this list, but it still has its uses. It’s sleek and compact, and is one of the easiest ways to turn your iPad or iPhone into a mobile recording studio. It’s not great for home studios, but if you are a guitar player who likes to travel light, this device is for you! Check out more on the Line 6 Sonic Port in the full review. One of the biggest and most consistent misconceptions about audio interfaces is that you have to spend a lot of money to get a good one. However – as out chart may have hinted – this is simply not true. With audio interfaces, there is a very well-defined base performance. The models we have featured in the chart meet (and sometimes exceed) that performance. Of course, we’d be lying if we said a $500 audio interface doesn’t tend to deliver more versatility and better features that something in the budget range, but the chances are that the core performance is more or less the same. At the end of the day, all affordable audio interfaces are designed primarily to deliver good sound on a budget. Most will offer both a microphone preamp and an instrument channel, as well as decent output options and controls, but you can’t expect much more than the basics. In 2018, there are four ways of connecting an audio interface to your computer (increasing in speed): USB, Firewire, Thunderbolt and PCIE. When it comes to connectivity, a smaller budget is naturally going to be a limiting factor. With this in mind, it should be no surprise that most entry-level interfaces use a standard USB 2.0 setup. Faster connections, such as Firewire and Thunderbolt, are more or less reserved for pro-grade audio interfaces. Aside from being guaranteed connectivity with your computer (because all computers have USB inputs), the bandwidth USB 2.0 allows for is capable of pushing the 24-Bit/192kHz rate, so for most home users and beginners, this connection will be fast enough. When your needs start calling for much more than that, it is time to look at upgrading your audio interface. Another thing to look out for is whether the audio interface is compatible with both your operating system – PC or Mac – and your DAW (Digital Audio Workstation) software. Thankfully, more often than not, even a budget audio interface will be compatible with both Windows and Apple products, and pretty much all DAWs, including SONAR, Pro Tools, Ableton, Cubase, and Studio One. However, you should read reviews or visit the manufacturer’s website to determine if it will be compatible with your DAW. If you don’t have a DAW yet buy your audio interface first, then find a suitable DAW that will work with it. In short – yes! In most cases, every half-decent interface comes with an XLR connection and a solid mic preamp that will allow you to record vocals. However, it is up to you to determine what quality you need. While a budget interface will allow you record, if you are looking for a crystal clear and completely transparent sound, you might have to spend a bit more. However, for general use and beginners, a budget interface will do a good job. Because the budget range is just as diverse as the rest of the audio interface market, one of the most important factors you need to consider is your main use for the interface. For example, some interfaces only offer a few inputs, such as one microphone line and one instrument line – for individuals this will be ample, but for others (such as those in a band) it won’t be enough. Some budget interfaces offer two or even four inputs, sometimes cutting corners in other areas to accommodate these, however you may want to increase your budget to find something more suitable. Also consider the form factor and size of the device. Will you be keeping it in your home or studio? If so, you can opt for a slightly bigger or heavier device and it won’t make much difference. However, if you are always working on the fly, a small, lightweight and rugged device may be better for throwing into your gig bag. In this budget price range, you won’t find any rack interfaces, but it’s still worth being aware of the dimensions and weight before you buy anything. Finally, as we have touched upon, the higher the price you pay for an audio interface, the better the sound quality. If you are recording for fun, to experiment or to make tracks for demos and so on, then chances are a budget interface will fit your needs. If you are trying to make a piece of music for a wider audience, you may want to opt for a more expensive interface to ensure you are getting the best quality. An audio interface is a core piece of hardware for every modern home recording studio. It’s hard to imagine creating music without one. The affordable interfaces we have shown you today are by far some of the best you can buy on a budget and will do the job for any home studio. Look for one that meets your needs and then read some reviews about it. Don’t be afraid to peer into the sub-$200 range, just in case you find something more suitable. Good luck with your search for the perfect budget audio interface!